Candy Crush is a very addicting game but there are some ways to make it a little easier on you. Most people do not know that you can actually reshuffle the candy crush board if you are not satisfied with how the layout is. You have to be playing a level that is not timed. If you are playing a time level, this tip will not work because the level starts automatically when you enter the level. If its any other level you can actually exit out of the level and re-enter it with a shuffled board. First, before making any moves click the yellow arrow on the bottom left hand corner of the game screen. When you click the yellow arrow in the bottom left corner of the screen, the menu will pop up and you will see a few options. Click the little red door (this means exit the level) and you will return to the candy crush episodes screen. 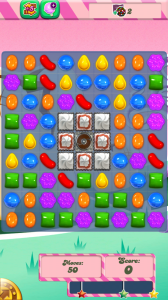 Click back into the level you were currently on and you will notice that the Candy Crush board has been shuffled. You can do this trick as many times as you liked until your satisfied with the layout of the board. You will also notice that it doesnt take away any lives. Enjoy!